What are People Saying About MY Access!? View Demos of MY Access! MY Access! Home Edition is an online writing application which fits neatly into any curriculum! Whether you’re homeschooling, tutoring students after school, or just trying to help a child improve his or her academic confidence, you’ll enjoy the time-saving technologies, valuable self-paced instruction, and motivating feedback in MY Access!. Watch your child improve his or her critical thinking skills and confidence in all subject areas as his or her writing skills grow. Why is it so important to teach writing across the curriculum? While writing is an important skill by itself, it is also closely linked to all other subject areas. As you combine writing instruction with other areas of study, you’ll quickly discover how well your students are learning and where they need more instruction. When students first learn to write, they begin by focusing on the writing process itself: planning, organizing, drafting, revising, editing, and publishing. This process enables them to generate ideas, link them together in meaningful ways, and express them creatively—all while obeying the “rules” or conventions of writing and grammar. …then, they write to learn. As students grow academically, the writing process quickly becomes a tool used to reach higher educational goals. Effective writing at this level enables them to organize, clarify, and communicate their thoughts across subjects, such as social studies, science, and math. Successful writing skills thus open the door to many new learning opportunities. How will MY Access! Home Edition help you? Self-paced, interactive writing activities and individualized learning plans help you enable your student to become a motivated, independent writer. Immediate, accurate feedback, frees you from the stress of having to grade every word your student writes. Easily integrate MY Access! into any curriculum and support and track your student’s performance along the way. With more time to teach, your student will become a more confident thinker and evaluator of his or her own writing. The Home Edition is not a stand-alone writing curriculum in itself. It doesn’t present the writing process in an old-fashioned, linear way like most textbooks. It doesn’t focus exclusively on the mechanics of writing like other electronic tools. And it certainly wasn’t designed to replace teachers altogether! Rather, MY Access! provides users with a truly customizable learning environment. At the center of MY Access! is IntelliMetric®, an artificial intelligence scoring tool. 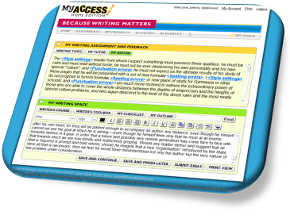 This tool instantly evaluates student writing against a standard rubric and provides students with suggestions to improve their writing. All of its feedback is aligned to the core traits of writing: Focus, Organization, Content Development, Language Use, and Grammar. Around this intelligent core, MY Access! incorporates instructional courses for each genre at each age range, an in-depth writing manual, organizational resources, and a host of word-processing tools. Parents and students decide which features of the program are appropriate for them at each stage of the learning process. Assign pre-loaded writing assignments or enter your own. Utilize the instructional courses in MY Access! or work with traditional offline curricula. Have your children work independently with MY Access! or provide hands-on feedback and direction. MY Access! won’t dictate how you teach writing to your students. It will just make it easier for you! Each 12-month subscription to MY Access! Home Edition includes one parent account and your choice of either three or six student accounts. MY Access! is completely Web-based, so there’s no software to load and it’s accessible anywhere you have a computer and Internet connection—at home, at school, or at the library. To ensure your computer is ready, run a system requirements check. Immediate essay scoring and individualized feedback is available from the award-winning artificial intelligence scoring engine, IntelliMetric. A word processor with editing and writing tools, including a thesaurus, multi-lingual grammar-checker, spell-checker, and word bank, helps students vary and improve their vocabulary. Detailed, prescriptive revision plans focus students’ revision activities on the key traits of writing: Focus, Organization, Content Development, Language Use, and Grammar. 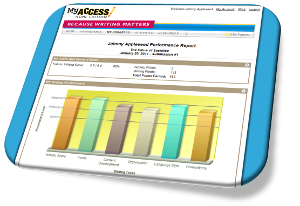 Individual progress reports are easy to access and share with others. View a sample progress report. Graphic organizers and other printable resources help students plan and build successful informative, persuasive, and narrative essays. Unlimited custom writing prompts can be entered and scored immediately, making MY Access! a valuable instructional tool throughout any curriculum. Ninety-six pre-loaded writing topics for three distinct age groups (8–10, 11–14, and 15–18) encourage students to begin writing immediately. Connect with fellow MY Access! Home users on our Facebook page, were we also post regular writing instruction, lesson plans, and tips to help you use MY Access! more effectively! Use custom prompts created by fellow MY Access! users, as well as submit your own, on the MY Access! Home Prompt Database. Looking for the version of MY Access!® for school-wide deployments?